Hints (St. Bartholomew) Churchyard, Staffordshire, contains 1 Commonwealth War Grave from the First World War, - a soldier of the Yorkshire Regiment. Richard Roberts (<richard@nosnailshere.co.uk>) has provided the photo of the soldier's grave and of St. Bartholomew's Church. The Yorkshire Regiment, transf. to (237976) 407th Agricultural Coy. Labour Corps. 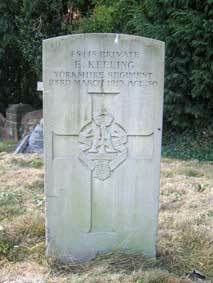 Son of George and Mary Keeling; husband of A. Keeling, of The Hill, Elford, Tamworth. Born at Market Drayton. Died at home 23 March 1919. Aged 30. For a larger sized image of Private Keeling's headstone, select the image on the left. Close the window that opens to return to this page. 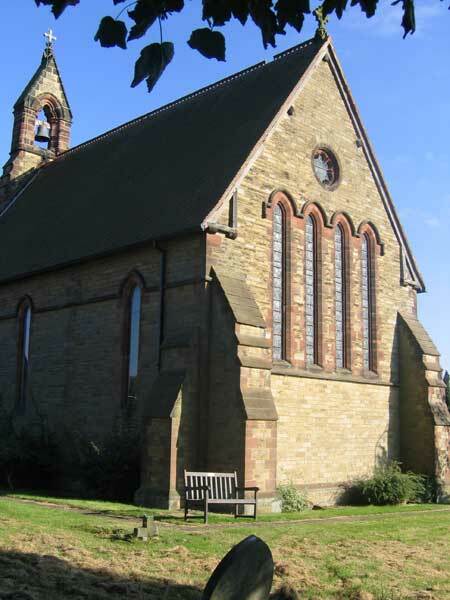 St. Bartholomew's Church, Hints (Staffordshire), viewed from near Private Keeling's grave.